Clean spinach. Cut onion into thin strips, finely chop garlic, and halve cherry tomatoes. Then, heat up 1 tbsp olive oil in a deep pan. Sauté garlic and onion for approx. 3 – 5 min. until fragrant and translucent. Now, add pasta, baby spinach, cherry tomatoes, thyme, and basil to the pan and pour in the vegetable stock. Stirring occasionally, simmer for approx. 10 – 12 min. until the liquid has reduced. Season generously with salt and pepper. 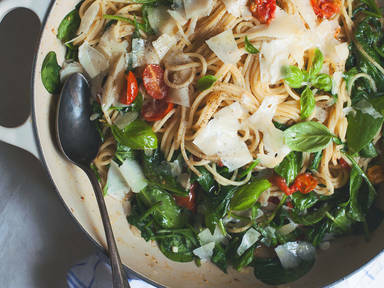 Serve sprinkled with basil and freshly grated Parmesan.